Intimate, easy on the pocket, and so memorable! Christmas spirit took over our lovely apartment in so many ways. The joy of setting up a tree and personalizing it with charms, was soon followed by cozy get togethers with friends over a board game night, movie viewing, and cooking sessions. One activity I absolutely enjoyed was a fun take on a paint night with my lovelies! I have never given much thought to miniature paintings. Go big or go home was my general attitude to paintings. And secondly, painting was always a solo activity for me. It was my retreat. If it is something I love so much, why not share the joy with friends? And so it was born — an activity that will henceforth be a constant with my girl friends. 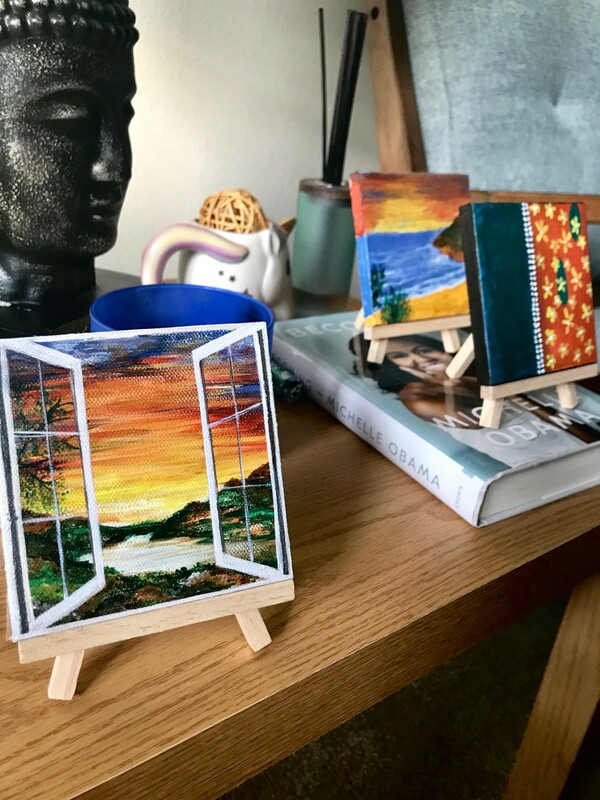 When looking to create a paint night experience at home, a mini canvas works best for two reasons: you can complete the painting, and not limit your imagination due to perceived lack of artistic inclination. Anything and everything can be created on a mini canvas since details that require that ‘artist’s touch’ can be masked due to scale. Though there are many sizes available at Michaels, we picked the 4*4 canvas set. You can also find these on Amazon. Learning about acrylic paint has been a game changer for me! I have dabbled in water colors, oil paint, and pastels before. But acrylic has made it easy to bring a piece to completion rather quickly. It works best for a paint night as there is minimal drying time (water being the medium used), errors can be easily covered up using fresh paint, and it can be easily washed off if you get some on you during the process. Working with acrylic is quite an intuitive process if you have used watercolors. Beyond flat painting, you can add texturing using gels, paste and mediums, slow the acrylic drying process using retardants, and add dimensions using painting knives. We got a basic 12 color set of acrylics from Michael’s for $5. Given that the canvas is very small, thin brushes will be most useful for the details. A flat brush and round brush will be required for creating the background. A synthetic brush set including all brush heads can be purchased on Amazon to cater to the requirements of the group. Other essentials are a palette to mix the paint and dilute it with water as required. I just use recyclable paper plates with a plastic film for this purpose. An unused glass from the kitchen can be used to hold the water. And bring some paper towels to absorb any excess water from the brush as you start painting. Last but not the least, don’t forget to purchase the mini easels to hold and display your work of art! They stand perfectly on your corner table, entertainment unit, or work desks displaying your creation! For our 4”x 4” canvas, this easel from Michael’s worked great. Think of a broad concept that you would like to capture as a painting. It could come from a personal experience or something you must have seen. And then look online for existing photos or paintings on your idea. If nothing comes to mind, just pull up the good ol’ pinterest for some lovely ideas. I found these boards super cute: Board 1, Board 2. Sometimes, you don’t even have to go online. The inspiration could be right there in your phone as photos you clicked. Look for sceneries, still life, people, plants or animals your might have clicked! And lastly you can just look around your home. Any object or setup might inspire you to capture what you see. Perhaps an antique piece, a flower vase, or just a cozy corner in the room? That’s all the pre-work needed. See images below for how our evening unfolded. The coffee table served as an ideal platform for us to gather around with canvas, paints, and tea. We also lit a holiday candle to further immerse ourselves in the Christmas spirit. All the material ready for us to dive in! Paint, canvas, brushes, and a disposable plate to serve as the palette. Three hours, so many fun conversations, and an immersive paint experience later here they are. The best thing about these pieces? Each of us found the inspiration for these from our personal experience. The first is created by a lady who is currently deep in planning her sister’s Indian wedding; hence a saree inspired painting to depict the rich work in Indian wedding clothes. The second gorgeous piece is by this talented lady who loves travelling, and this one is right out of an image she captured during her recent travel to the coast; represents her happy place. And the third is mine to capture the beautiful sunset views we see from our apartment every single day. Now fire up that tea kettle, play your favorite spotify playlist, bring on the paints and get in the spirit of paint night with your lovelies.